its new category time over at category stories, with our guest this month being amy lapi! the prompt for this month was '---was one of her very best friends'. my Lo is about my friend nicole and how we always pick up where we left, even though we dont see each other much any more. 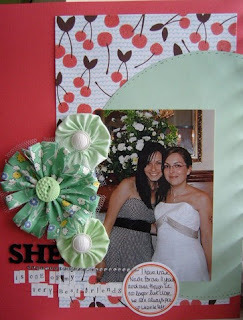 I also doubled up this LO for sketch 39 from twisted sketches which used the twist 'fabric'. As you can see, my flower embellies use the twist. gorgeous work on this! love your fabric flowers!